Motor Coater is easy to apply, offers superb coverage and yields a self-leveling professional looking finish brushed or sprayed. These engine enamels provide deep, rich pigmented colors for excellent coverage. 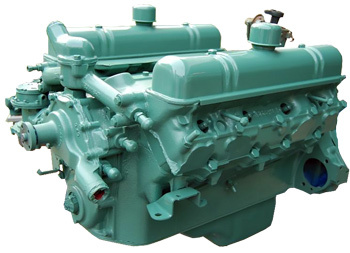 Your engine will be a show stopper at this DIY price! Motor Coater is easy to apply, offers superb coverage and yields a self-leveling (brushable) professional looking finish. 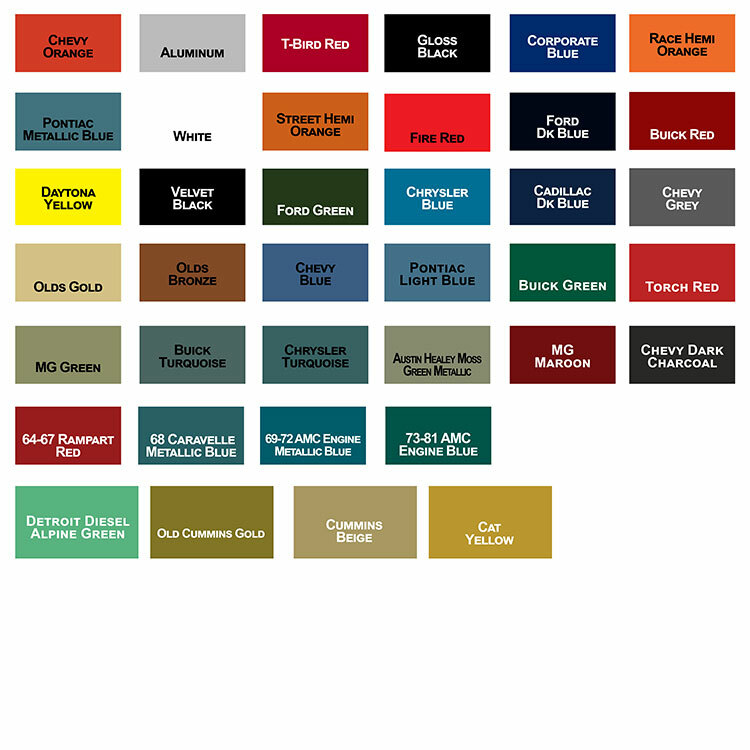 Motor Coater colors are an exact match for the original color offering a rich, deep factory finish. 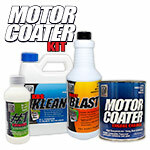 Motor Coater is very durable protecting your engine from chips, chemicals and heat. Great for Brake Calipers Too! 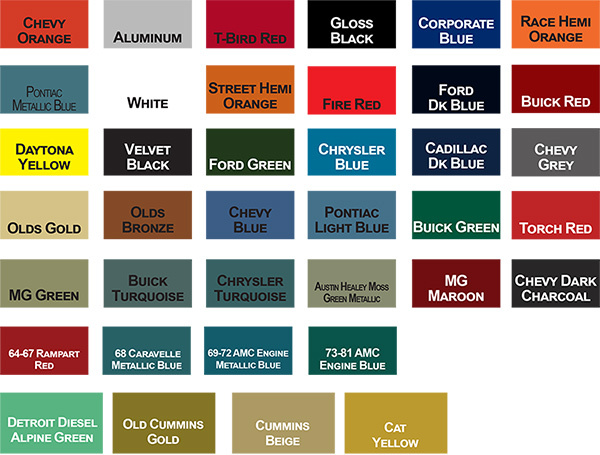 Automotive Colors: Chevy Orange, Gloss Black, Aluminum, Ford Corporate Blue, T-Bird Red, Pontiac Metallic Blue, White, Street Hemi Orange, Fire Red, Ford Dark Blue, Daytona Yellow, Velvet Black, Ford Green, Chrysler Blue, Cadillac Dark Blue, Race Hemi Orange, Olds Gold, Olds Bronze, Chevy Blue,Pontiac Light Blue, Buick Green Late, Buick Red Late, MG Green, Buick Turquoise, Chrysler Turquoise, Austin Healey Moss Green Metallic, MG Maroon, Chevy Grey, Chevy Dark Charcoal,64-67 Rampart Red,68 Caravelle Metallic Blue,69-72 AMC Engine Metallic Blue,73-81 AMC Engine Blue,Torch Red. 12oz Aerosol or Pint is Usually Enough to do an Automotive Entire Engine. 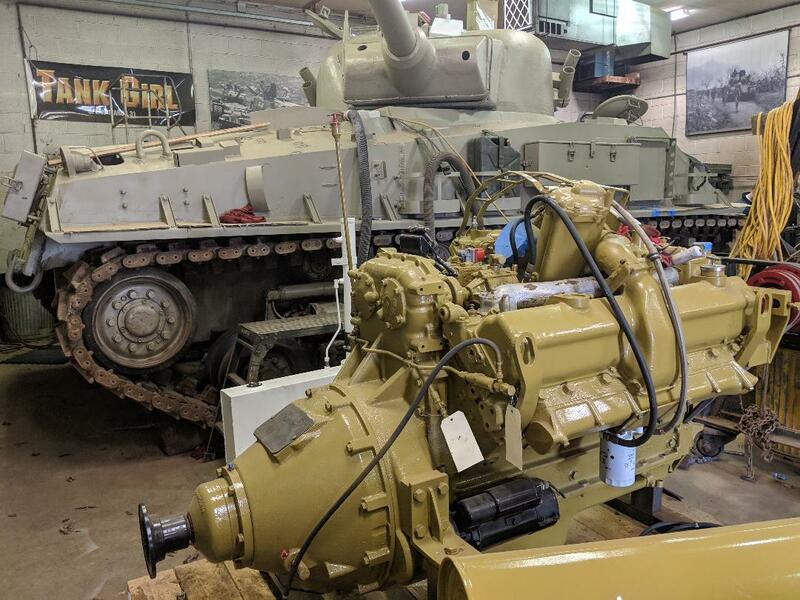 A Quart is usually enough to do a Diesel Engine. T-Bird Red: OEM engine color, not body color. Went on Good, Dried Fast. Thanks! Nice to find a good product that matches an unusual color. This is excellent paint for engine coating. I used it to paint the transmission and engine. After cleaning the block, I painted the it. Four days later, I was honing cylinders, chasing holes, and getting the block wet with solvents and oil. The paint dried rock hard and cleaned up with no damage from the solvents. Great stuff! I love the way the motor coat laid. At first it seemed a bit spotty, but the second coat did a fantastic job of finishing the final product. I ove the paint and have ordered several different colors! Lays down like it was sprayed! I love this paint. I've used the frame coater and motor coater, and both lay down like they were sprayed, when applied with a brush. It dries to a nice, hard coating that stands up a thousand times better than any regular spray paint. My only complaint is that the Oldmobile Gold motor coater dries to more of a tan color than a bright gold, but it's still a great color coating. I have excellent results each time I used Motor Coater! I was amazed with how it flowed on. The end results were very satisfying. Excellent products and highly recommended. I have rebuilding and painting AMC's for 35 years.....I can honestly say this paint is the best I have ever used. It lays very nice, the metallic stays suspended and dries to touch pretty quickly.....the only question left is how it lasts...that will take time to know. But the Rust Kleen and Rust Blast worst very well, zero fisheyes and the best part of all is the color is dead on, I compared to NOS factory painted parts I have that have never seen weather or actual installation since the paint was applied at the factory in Kenosha.....perfect match. The :go to paint by Seymour in Spray can was super close 25 years ago, but no longer and it is now way to light. Q: Is the motor coater UV resistant? Also can I apply Diamond clear on top of it? A: Yes, Motor Coater is UV resistant. You can apply DiamondFinish Clear over cured Motor Coater for increased durability. Please do this after the Motor Coater has cured for 7 days. Was this answer helpful? 21 of 22 Customer(s) found this Answer helpful. Q: Looking to brush this on and wanted to know what type of thinning agent I would need? A: Thinning is not generally required but if needed 5%-10% is normally adequate. Use KBS #1 Thinner only which is a slow evaporating solvent. 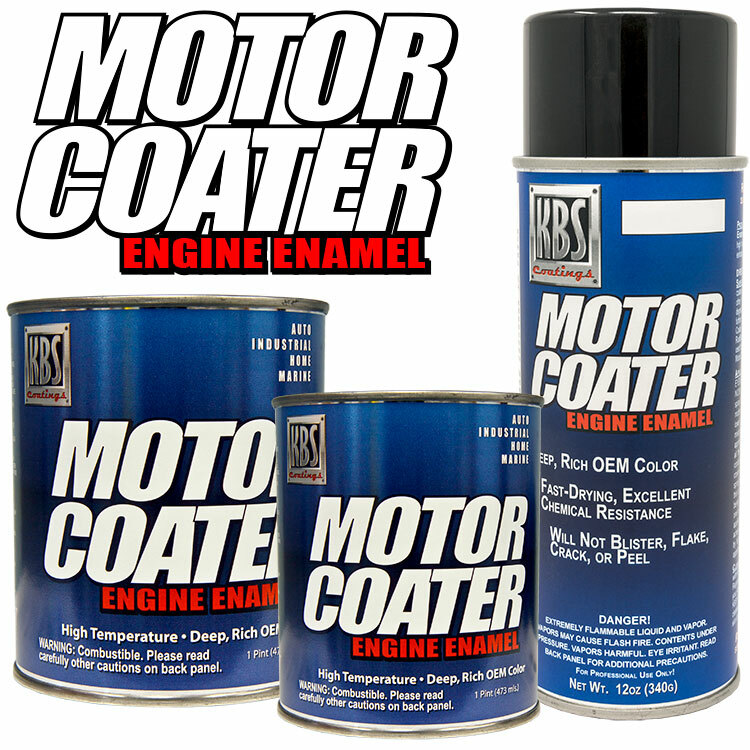 A: We are in the process of rolling out some of the Motor Coater colors in a 12oz Aerosol Can. Check back often. 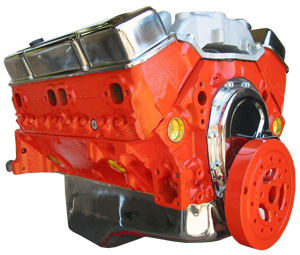 Q: Do you need to primer, or use a prep coating on the motor first? A: As long as the motor has been cleaned well with KBS Klean, you can simply apply Motor Coater with no primer necessary. If you need rust protection, we always recommend cleaning with KBS Klean, etching with RustBlast and then RustSeal (which can be brushed on) as the primer (at least 2 thin coats) and then Motor Coater. The other benefit to applying RustSeal before Motor Coater is that RustSeal helps to smooth out what is typically a rough surface of the motor making the Motor Coater look amazing when it is brushed over that newly smooth surface. As every painting professional knows, the keys to any long lasting paint job are good surface prep and the use of quality materials. Our complete KBS Motor Coater Kit was developed to guarantee just that! Your engine will be a show stopper at this DIY price...too bad it's kept under the hood!